If Found, please put in box for Tooth Fairy. I would like to point out a few things as well. 1. This gap, when viewed head-on, makes Elise look like Jody Shelley, one of Elise's favorite Sharks. 2. Her best friend recently lost the same tooth-they have matching smiles now! Bravo, Elise. The next trick, which you may have already mastered, is to use the loose tooth to its fullest to make sure others know it exists. Wiggle it crazily. Make it stick out at odd angles. Show it proudly to everyone over the age of 12 that you meet. 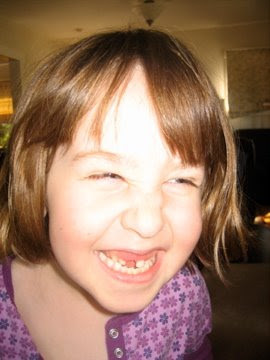 Even the most grossed out adult will praise that loose tooth. I will keep my eyes open for your tooth and send it directly to the tooth fairy. Oh no!!! I knew my granddaughter would lose teeth if she started playing hockey. What is next, a crooked nose? How is hockey going anyhow?